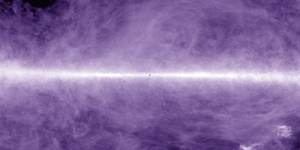 The Neutral Hydrogen sky is now available on Chromscope. This all came about because Chris Samuel asked whether it could included, and pointed towards an October 2016 press release from the “HI4PI” team. The data that the team made openly available includes a HEALPix map, which makes it straightforward (well, when you’ve done it before) to plot to a full-sky Cartesian map, apply a colour, and divide into tiles. The image shows the Hydrogen line emission – radio waves emitted by cold hydrogen gas at a wavelength of 21cm (a frequency of around 1.4 GHz). Since the gas is neutral, it must be cold, since if it were heated up to more than a few thousand degrees the gas would be ionised. Ionised hydrogen gas emits light in the visible part of the spectrum, particularly at a specific wavelength called the “Hydrogen alpha” (also available in Chromoscope – giving a nice way to compare the warm and cold parts of our galaxy. So I was invested in this topic after getting back into the Cyberpunk and Futuristic genre and I was wondering, how much money would it take to produce a full library of the nightsky with the Chromoscope feature for the viewers? I am more of a fan of the Microwave Electromagnetic Spectrum and this helped me get an idea of how it would feel to see in all visible & non-visible light. Of course, this kind of stuff isn’t cheap and along the line of military-grade tools but do you think enough money from the viewers or congress could go into it? Thanks for giving me insight of the Hydrogen spectrum, I never knew a thing like this until now but I’m still figuring out what H-beta and H-gamma is and how it affects the nightsky. I’m not sure what you mean by “full library”. There are more detailed views of the sky available through “World Wide Telescope” and “ESA Sky” – you can explore those by right-clicking on Chromoscope and selecting the option to view in one of those websites. In terms of what the world would look like in other parts of the spectrum, it is possible to buy near-infrared cameras (“night vision” goggles) and mid-infrared cameras (“thermal cameras”), but the technology for most other parts of the spectrum isn’t mature enough to allow hand-held devices. They often need very large receivers or significant cooling. Note that all of the images on Chromoscope are “false colour” (perhaps described better as “representative” colour). In terms of H-beta and H-gamma, they are also emitted by hot Hydrogen gas (just like H-alpha), but at increasingly higher energies, and the sky would look very similar. While H-alpha is at a wavelength in the red part of the spectrum, H-beta is green-blue, and H-gamma is blue.